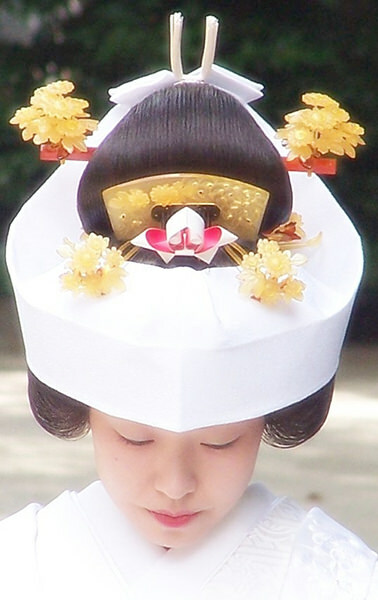 Tsuno-kakusi is a Japanese traditional headwear and a part of a kimono dress (refer to #007) for brides. In a Japanese style wedding ceremony, a bride is usually wearing a Tsuno-kakushi on Shimada-mage (refer to #231). The Japanese word "tsuno" is "horn" in English and "kakushi" is "hiding", respectively. The name indicates many women seem to secretly have horns of onis（refer to #090) as a metaphor for the rage to their spouses.